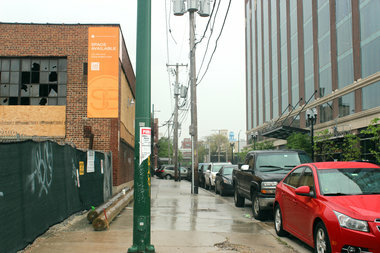 Ace Hotel plans to build a hotel at 311 N. Morgan St. (left) in Fulton Market, according to plans. FULTON MARKET — Zoning that would make way for an Ace Hotel to open in Fulton Market has received preliminary approval. The rezoning of the proposed Ace Hotel property, located at 311 N. Morgan St., was approved by the Landmarks Commission earlier this month and by the city's Plan Commission last week, said Peter Strazzabosco, deputy commissioner of the Chicago Department of Planning and Development. If City Council gives final approvals, the boutique hotel will be located across the street from the office development at 1000 W. Fulton St., future home to Google's Chicago office. Plans call for a seven-story hotel building to be built at the site with 159 hotel rooms, ground-floor retail space, a restaurant, rooftop patio and parking. In April, City Council voted to approve an ordinance introduced by Ald. Walter Burnett Jr. (27th) that pulled a parcel of land at West Fulton Market and North Morgan Street out of the Kinzie Industrial Corridor manufacturing district, according to a Crain's report. Sterling Bay, the development firm that owns the property, did not answer questions Wednesday. Ace Hotel representatives declined to comment on the deal. Ace Hotel also operates hotels in New York, L.A., Seattle and London, among other locations.